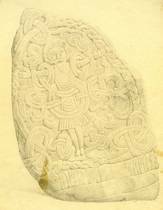 King Gorm’s rune stone drawn by Adam Müller (1835). The National Museum. In 1835 the young painter and illustrator Adam Müller (1811-1844) was in Jelling. As a student of the C. W. Eckersberg he followed in his teacher’s footsteps to become a historical painter. 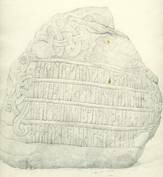 In Jelling he painted both stones, that is the two sides of King Gorm’s small rune stone and the three sides of Harald’s large rune stone. The drawings were subsequently finished by P. Schöler. An actual realism and degree of detail clearly stands out from Adam Müller’s drawings in his representation of the two rune stones. Therefore from a conservation perspective the drawings also contain more information than the earlier drawings. Müller has thus drawn the broken-off pieces quite precisely, that is with clear edges, but diffusely where he was in doubt. Only a few of the cracks have been drawn. On the front side of Gorm’s small rune stone a large broken-off piece has been drawn in the second and third lines of the rune bands in the words karþi and aft. The broken-off piece is even more obvious today. On the other hand Müller has not drawn the broken-off area, which today can be seen in the first line of runes in the word kurmR. On the back side a single crack is marked to the left of the band of runes running down from the shoulder on the stone’s west-facing side. The rune band on the back side of the stone is finished at the top with two spirals on both sides and a sloping line to the right. Müller must have been familiar with Søren Abildgaard’s drawing and interpretation of this diffuse motif, and has interpreted it further. In spite of the great realism shown in the drawings there has apparently also been room for conjecture. Today the motif is interpreted as at least one snake’s head. On Harald Bluetooth’s large rune stone Müller has drawn some cracks in the ornamentation over the inscription on the text side. A large crack in the line at the bottom has also been drawn in. On the animal side a large broken-off area on the bottom right is clearly marked after the sequence nuruiak. In addition, the crack which runs downwards from the large triangular broken-off area is marked until the acanthus ornament at the back of the animal’s head and a pair of cracks can be seen to the left. There is also a crack in the beginning of the band of runes. On the Christ side the whole area in the middle of the inscription is missing, apart from the bottom part of the k rune in kristną. In addition, Müller sketches a crack in the left triquetra near Christ’s legs and a crack at the top in the triquetra to the right of the legs. 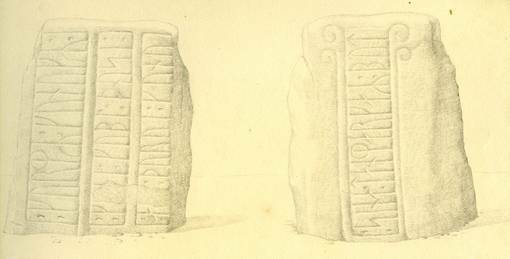 From a conservation perspective Adam Müller’s drawings testify to the fact that the rune stones were already suffering from decomposition by 1835. However, the damage in the form of broken-off areas and cracks was not of the same extent as it is today. Thus the decomposition is a continuing process. 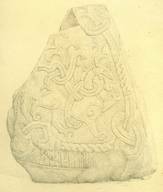 King Harald’s rune stone drawn by Adam Müller (1835). The National Museum.